Malcolm Gladwell's provocative new #1 bestseller -- now in paperback. Three thousand years ago on a battlefield in ancient Palestine, a shepherd boy felled a mighty warrior with nothing more than a pebble and a sling-and ever since, the names of David and Goliath have stood for battles between underdogs and giants. David's victory was improbable and miraculous. He shouldn't have won. Or should he? 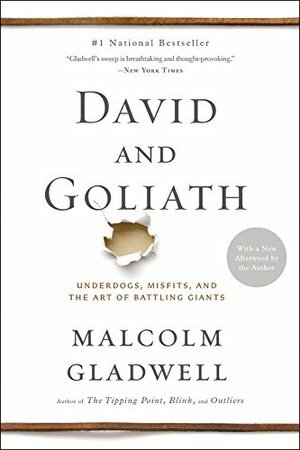 In DAVID AND GOLIATH, Malcolm Gladwell challenges how we think about obstacles and disadvantages, offering a new interpretation of what it means to be discriminated against, suffer from a disability, lose a parent, attend a mediocre school, or endure any number of other apparent setbacks.In the tradition of Gladwell's previous bestsellers-The Tipping Point, Blink, Outliers and What the Dog Saw-DAVID AND GOLIATH draws upon history, psychology and powerful story-telling to reshape the way we think of the world around us. Although I sometimes find myself questioning certain details related to the conclusions in Gladwell's books, I rarely doubt his broader assertions. And I always enjoy his storytelling. In David and Goliath, he makes a compelling case that the real advantage less established players have when facing entrenched rivals is not so much the element of surprise as it is the predictability of one's lumbering opponent. Gladwell uses all kinds of examples to make his points, ranging from California's three-strikes rule to doctors fighting childhood leukemia.